Skiers are being warned to ‘stay calm’ after footage emerged of what appears to be the mythical Yeti wandering around a Spanish ski resort. 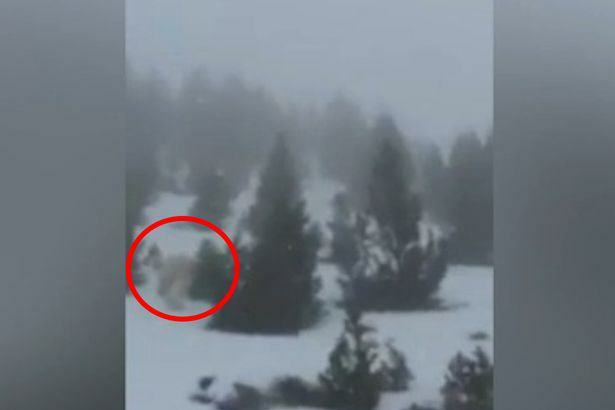 The rather shaky footage shows what appears to be a strange ape-like creature with white fur stomping through the snow at the Formigal ski resort in north-eastern Spain, the Mirror reports. The picture went on to be retweeted thousands of times, and a sparked wild debate over whether a Spanish Yeti was on the loose or if it was a bear, computer effect or even a soldier dressed mountain camouflage. The mystery remained unsolved over night, although skiers have been assured there was no cause for alarm. We have spoken to the witnesses of the sighting to identify the area in which it took place and after combing the area we have found nothing. We believe therefore that there is no cause for alarm and that visitors’ security is guaranteed. In any case we will remain alert. Just to be pedantic we feel it needs pointing out that the Yeti’s a Himalayan monster this – were it real – would technically be a European Bigfoot sighting.